Just like in the grieving process, we recover from depression in leaps and bursts. We’re sure we’re never going to get better. We have good weeks and bad weeks. We have good moments and bad moments. Depression, by its very nature, flings us all over the emotional spectrum; It’s part of the process of healing. It’s never a straight shot from point “A”, to point “B”. It’s almost always a roller coaster ride. Eventually, it normalizes to a smoother ride. Moods are seldom stable even when we’re not depressed. It’s a rare person whose moods stay even-keeled on a consistent basis. Many times we ascribe the word “stable” to people whose personality naturally lends itself to a kind of outward calmness. But people can be very “noisy” on the inside, even though they’re very quiet out the outside. We put way too much stock in people’s outward behavior. My husband is very stable and his personality is more low-keyed. When he is in a low mood it looks very different from me whose personality is more like the energizer bunny. When I’m feeling down, it’s obvious, with him not so much. Depression looks different on different people. The more extroverted the personality the more likely the depression will be obvious because there is a greater contrast to their normal demeanor. So no matter where you are in your recovery, take heart by knowing that the roller coaster ride you’re on doesn’t mean your recovery is in jeopardy. You’re just experiencing normal fluctuations on your journey to health. 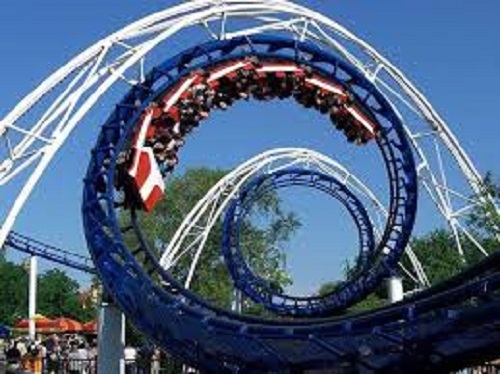 When we’re actually experiencing a “roller-coaster” kind of day though, it’s discouraging. On these kinds of days, it pays to look back and try to find some cause and effect. And there is always a trigger for our depression. Moods aren’t all over the place for no reason. But don’t give up. How have your last few days been? Have they been up and down? Can you pinpoint any causes? We can’t always but that doesn’t mean there isn’t one; only that you can’t find it. Don’t despair. Start tomorrow and monitor your day and if your mood starts to fall even a little, stop and take a quick assessment of how you’ve been thinking or talking to yourself. Our spiraling moods often begin with our thoughts and words. A very Merry Christmas to each of you.